Oh to be young and in love...with comics. There's never been a better time to be a comics fan, as more and more publishers are breaking in to offer works that are varied and diverse. Janelle Asselin isn't one to sit on the sidelines as those publishers purvey their works and she's starting Rosy Press to publish Fresh Romance, a new digital romance comic magazine. Of course, such an endeavor needs a little help, which is where Kickstarter comes into play. The first issue of the monthly anthology features sundry stories ranging from a clandestine, queer high school love affair to an impeccably researched and illustrated Regency-era romance. In addition to three forward-looking romances, each issue of Fresh Romance delivers a relationship advice column by a quartet of divorced writers, behind-the-scenes art coverage and a fashion report. “Rosy Press specializes in publishing romantic fiction and nonfiction aimed at attracting a diverse readership,” says Asselin. “With our digital platform, FRESH ROMANCE can reach a diverse set of readers. FRESH ROMANCE is the comics answer to the popular modern romance novel, and we can digitally deliver it to anyone, anywhere, anytime.” FRESH ROMANCE content will be available in a variety of digital formats: via ComiXology or as a PDF, CBR, or ePub file, and will always be DRM-free. Unlike their real-world counterparts, FRESH ROMANCE stories never end – they will later be published as ebook collections. A twist on the iconic high school love story by Kate Leth, Arielle Jovellanos and colorist Amanda Scurti, in which a queer couple keep their relationship under wraps by pretending to compete for the same, equally secretive guy. An otherworldly tale by novelist Sarah Kuh, who has a three-book prose book deal with DAW Books and who is penning her first comic with Sally Jane Thompson and colorist Savanna Ganucheau, in which a cynical, supernatural barista is trapped in this world… until she helps enough lonely souls find love. Rewards available exclusively through the Fresh Romance Kickstarter campaign support three-month, six-month and ongoing subscriptions, including the opportunity to be drawn into a story, an original comic to propose marriage to your loved one and one-of-a-kind prints and commissions, including: Five commissions by Chris Burnham; a Gene Ha sketch commission; a Dustin Nguyen-drawn original page from the Stephanie Brown Batgirl series; a commission of Harley Quinn by DC and Marvel artist Carmen Carnero; and an original page from the Stephanie Brown Batgirl series drawn by Pere Perez. 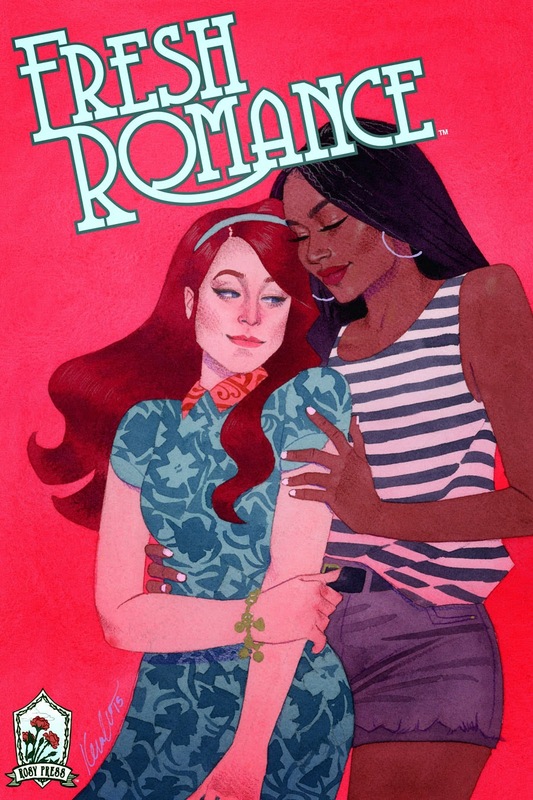 March 23, 2015--”Romance is coming,” promises FRESH ROMANCE, a new digitial romance comic magazine from Janelle Asselin, Senior Editor of ComicsAlliance.com and former DC Comics editor. If funded through the now-live Kickstarter campaign, Asselin’s new imprint Rosy Press will debut FRESH ROMANCE in May 2015. The first issue of the monthly anthology features sundry stories ranging from a clandestine, queer high school love affair to an impeccably researched and illustrated Regency-era romance. In addition to three forward-looking romances, each issue of FRESH ROMANCE delivers a relationship advice column by a quartet of divorced writers, behind-the-scenes art coverage, and a fashion report. Sally Jane Thompson is a comic creator based in the UK. Currently drawing 19th c adventure "Red Jack" with writer John Dickinson for children's comics serial The Phoenix, her work includes coming-of-age graphic novel Atomic Sheep (AAM Markosia), and comics and illustration for various publishers including IDW, Soaring Penguin, Imagine Publications and more. Her work focuses on thoughtful stories drawn with organic, expressive lines.